At the World Conference on Photovoltaic Energy Conversion (WCPEC-7) held last month from June 10-15 in Waikoloa, Hawaii, USA, Sascha Sadewasser, INL Principal Investigator of the Laboratory for Nanostructured Solar Cells, presented the most recent results of a collaborative work between his group and the group of Prof. Philip Dale from the University of Luxembourg. 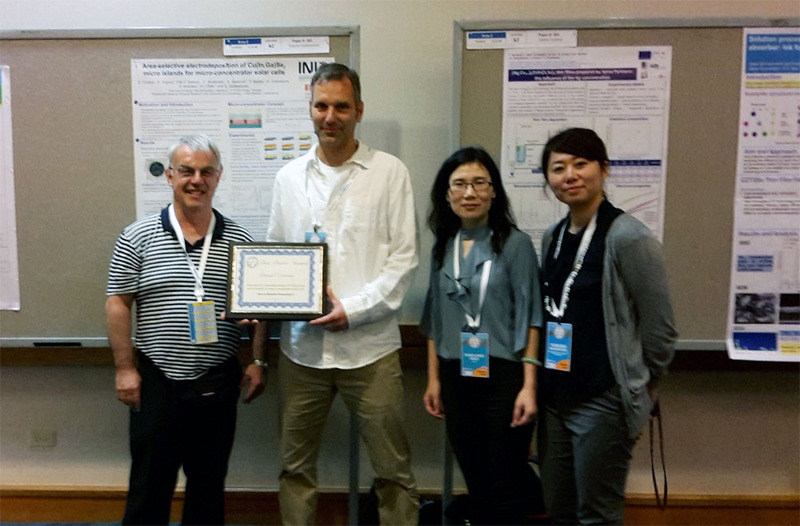 The poster presentation with the title “Area-selective electrodeposition of Cu(In,Ga)Se2 micro-islands for micro-concentrator solar cells” was awarded a Best Poster Award by the organizers. The work shows a proof-of-concept demonstration of a photovoltaic technology which is capable of reaching higher power conversion efficiencies with lower materials consumption of the Cu(In,Ga)Se2 absorber layer.